2017-02-16 Service rating : Excellent customer service, prompt response to email query after I placed an order. Product : Have not seen product delivered but it was well received! 2016-11-23 Very Happy with the arrangement and delivery. Thank you very much!! 2016-09-08 Service rating : The website was easy to view and it was so simple to place an order on-line. Delivery was on the day I requested and the delivery driver was a lovely happy young man who made you feel he was happy to be delivering your order rather than the delivery just being a chore for him. I would definitely recommend Flowers for Everyone to anyone who would like to purchase beautiful flower arrangements. Product : The cane vase the flowers arrived in was original and very effective and suited the native flowers perfectly. The flowers themselves were gorgeous with lots of large and small flowers to fill the vase. A perfect sized arrangement - not too large and not too small. I would definitely purchase this arrangement again - for any occasion. 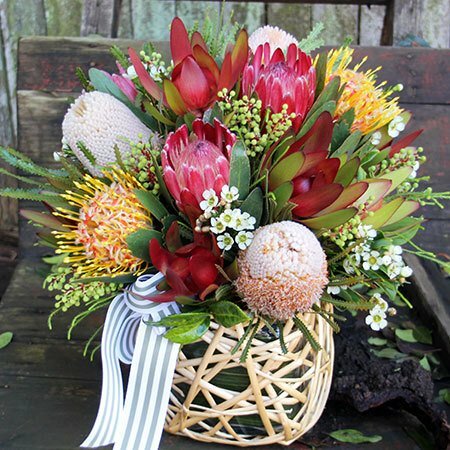 Anyone who likes native flowers will love this arrangement. Product : The natives were delivered to my daughter in Melbourne (while I live in Sydney) for her birthday. She said they were very fresh, nicely arranged and the delivery was prompt. Thanks very much for the excellent service. Much appreciated. 2016-08-30 Reliable and quality service. 2016-06-22 Service rating : I sent the wildflowers interstate so am unsure what they looked like etc but my sister said they arrived on time and they were lovely, so I would say that is excellent service. Product : Again cannot give an accurate assessment because I didn`t see them but as far as I know they were great. 2016-03-16 Service rating : Quick and easy online service. 2015-12-11 Service rating : rapid service & was contacted by you saying part of my message was cut off & when i rewrote my message for the card, it was sent exactly as i intially wrote it. this is not the 1st time i have ordered from you, & will contiune to do so! very pleased indeed! Product : my sis was very pleased with the flower arragmement & arrived on time.I shall continue ordering with your company. not only are you priced correctly, the flower arrangements are elegant & original. a far cry from other companies that tend to have very tacky presentations & misrable flower arrangements. good work & thank you for having such a eclectic choice! Product : This is the 2nd year that I ordered from them and the quality of the flowers are great. 2015-06-18 Excellent service. On time delivery. 2015-05-15 Service rating : Online ordering is easy and the flowers are always as beautiful as the pictures on the website, if not better. Product : The recipient absolutely loved the arrangement and the vase it came in. 2015-03-27 Cost was competitive, flowers beautiful and delivery perfect.